This page is about people who are doing scientific research on cane toads in the Northern Territory, Queensland and New South Wales, and transmitting information about our work to the public. We are part of TEAM BUFO. Rick Shine is a Professor of Biology at the University of Sydney. He's worked there almost all of his career, but in recent years he has been able to devote his time to research (with a lot less undergrad teaching and administration) through Fellowships from the Australian Research Council. The first of those was a Federation Fellowship (2006 to 2010, so covering the first five years after cane toads arrived at our main study site near Darwin). Rick has now been awarded a Laureate Fellowship, again from the ARC, to run until 2018. With the backing from that first ARC Fellowship, Rick created TEAM BUFO a few years ago, and he still heads the group. Rick has been passionate about wildlife, especially reptiles and amphibians, since he was a small child in Brisbane. He turned that passion into a career, doing an undergraduate degree in science at the Australian National University (in Canberra), then a Ph.D at the University of New England (in Armidale). Then, after a few years’ postdoctoral work in the USA (where he met Terri), they both returned to Sydney in 1978. Rick has been employed at the University of Sydney ever since. 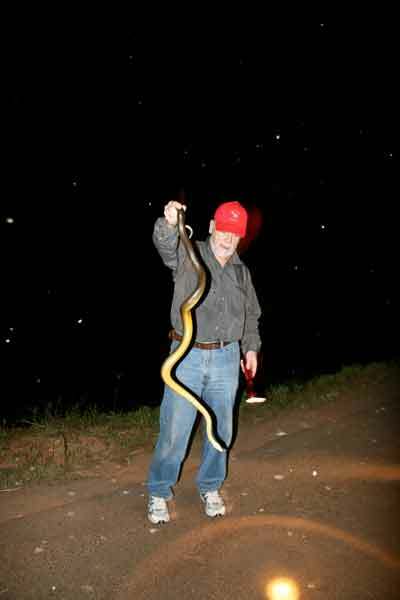 Rick has conducted research all over the world, mostly on the ecology of snakes (which was the subject of his Ph.D). He’s published more than 800 papers, and received many national and international awards for his research. For example, he's the only scientist who has received three Eureka Awards, for three different fields (research, mentoring, and communicating science to the public). The “official” university website has all the gory details if you’re interested. 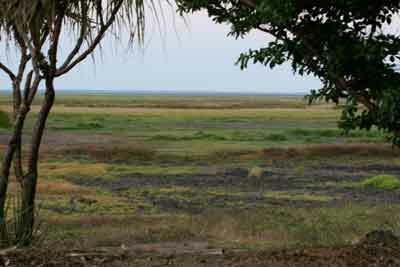 One place that became more and more important for Rick’s research was a small dam on the Adelaide River floodplain about 60 km east of Darwin, in the Northern Territory. Rick initially started working in the Territory in 1981, based at Jabiru in Kakadu National Park, looking at filesnakes, goannas and frillneck lizards. 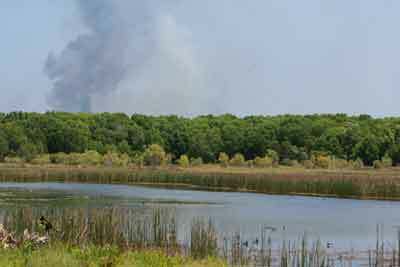 He soon shifted his focus to Fogg Dam, because it had terrific numbers of snakes and some friendly locals at the Coastal Plains Research Station, who helped out with advice and accommodation. Rick started ecological studies on the local pythons, and soon got funding from the Australian Research Council (ARC) to expand the study. He employed Thomas Madsen as a post-doctoral fellow to collaborate on his research. Tom still works on snakes and lizards at Fogg Dam but nowadays is based at the University of Wollongong. More funding from the ARC brought Greg Brown into the system on more snake studies, and the project just kept getting bigger and bigger. 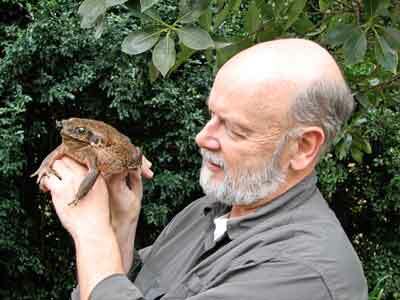 Rick in the lab with one of the cane toads that we use for television appearances. Photo by Terri Shine. 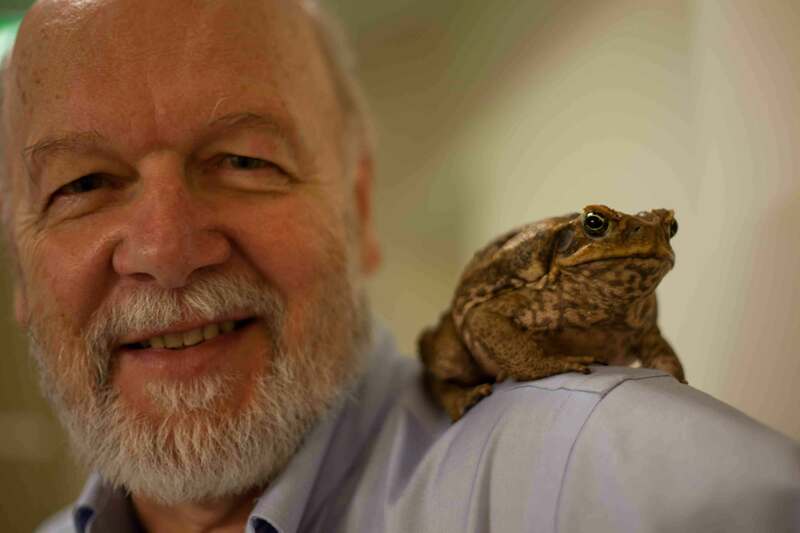 And then, cane toads appeared on our research horizons. The toad invasion front had been travelling from Queensland towards Fogg Dam for 70 years, and in 2004 it was just at our doorstep. 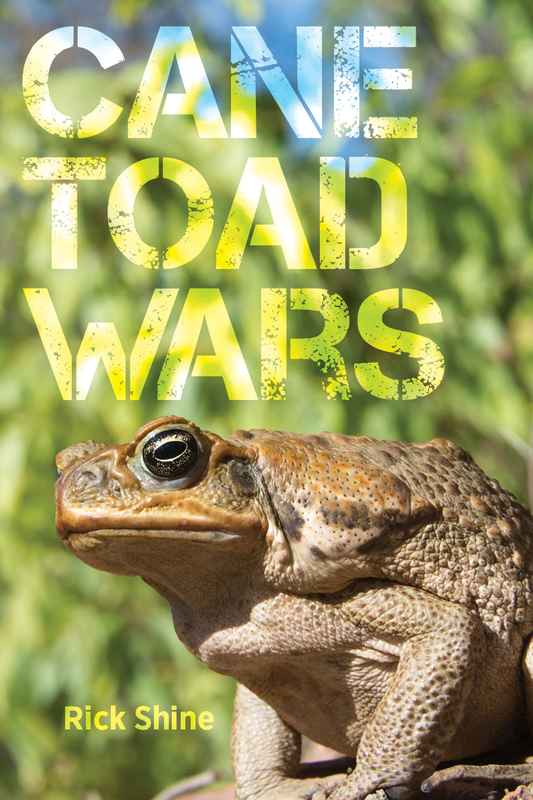 Clearly, this was a unique opportunity for Australians to find out what cane toads actually do at the invasion front, and what effects they have. Remarkably (given all the public money and private effort that has been devoted to toads in Australia), we really had very little detailed information on these animals. But with their impending arrival we had the chance to get that information at Fogg Dam – one of the most intensively-studied and thus best-understood chunks of tropical real estate in Australia, and probably even worldwide (tropical ecosystems have been ignored, compared to those in cooler climates closer to the main universities in North America and northern Europe). Rick was awarded a Federation Fellowship from the Australian Research Council (ARC), beginning in 2006. The funds from the Fellowship allowed a rapid expansion of our activities, at just the right time – shortly before the toads were due to arrive. The Australian Research Council is a federal government agency that supports scientific research. The main way we communicate the results of our research is to publish scientific papers in journals. These don't look much like the glossy magazines most people are used to reading - they are pretty drab and are mostly read only by professionals who conduct research in the field, and by up-and-coming research students. We also give talks about our research results at scientific conferences - again, to other scientists. There's nothing confidential about these results, and lots of our papers are available free from our “official” website. Rick's laboratory web site has lots of detailed information. Unfortunately, scientific papers aren't too easy to read. Most public statements in the media just involve people offering their opinions about things, without having to produce any evidence. Scientific papers are very different. They are checked by expert reviewers before being accepted for publication, and are rejected unless the paper provides all the evidence to support its conclusions. That's a really tough process - everything we say in a paper is checked carefully by at least two international experts, and the top journals reject about 90 to 95% of all papers that are submitted to them! It means that to be published in a scientific journal, a paper really has to provide reliable evidence to back up everything it says. So, the typical scientific paper has lots of numbers and lots of statistics. This means it's very reliable as a source of evidence - much more than anything you will hear in the media, which might just be somebody's guess or opinion, based on no real evidence at all - but it makes most scientific papers pretty difficult to read. So, we thought that it would be helpful to provide a more user-friendly version, so that people who don’t have formal scientific training can understand a bit more about cane toads, their effects on the native fauna, and what we can do to fight the invader. So that’s what this website aims to do. If you want more detail about the scientific evidence behind the information we provide on this website, then by all means pop across to Rick's laboratory website (see the link above) where you can see all of the papers listed, with quick summaries of each. Just email us (see the Contacts page) for the actual paper - with all the evidence - if you want to follow things up in more detail. 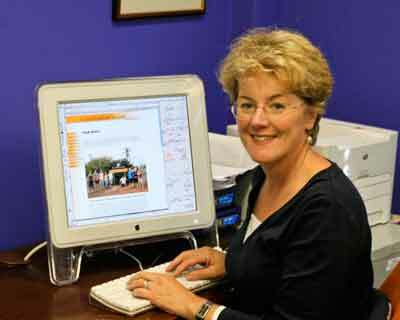 This website is produced by Terri Shine, whose main link to the strange and wonderful world of cane toads comes from being married to Rick Shine for the last 30 or so years.